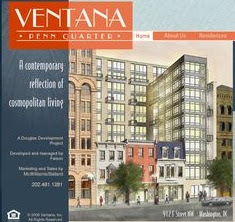 Like the Artisan, the Ventana, located at 912 F St NW, is one of the latest buildings to begin delivery, with 49 sales recorded by the District in the period April 2006 - January 2007; 13 have either not sold or have not yet had their sales recorded. For reasons unbeknownst to me, most of the recorded sales occured in the period April - July 2006, with a few stragglers in the later months. Located in the Penn Quarter area, this 12-story building with 68 loft-style units was formerly known as Jemal's Lofts and F Street Lofts. Originally priced from the lower $400's. 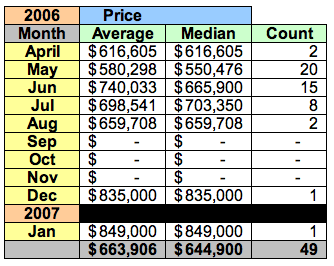 Pricing as of July 2005: 1 BRs from $600's, 2BRs from $900's, and 3 BR's from $1.5M. I assume DCLofts.com erred when it reported that 68 units were going to be built because only 62 units are listed in the District's real property assessment database, although it is possible the developer's plans changed in the intervening period. The building was developed by Douglas Development and Faison. According to Douglas Development's website, the Ventana's total project cost was $30M and the average sales price for the 62 condos is about $420 / sq ft. Marketing and sales are being managed by McWilliams/Ballard. The District recorded 49 sales through the end of January 2007. No condo flips have been recorded at the Ventana through January 2007. If speculators have bought condos at the Ventana, I'll have to say they don't seem to be as anxious as those at the Artisan to quickly dump their "investments" on the real estate market. Not to imply that nothing is happening; four units are listed on the MLS by their owners. The table below shows how hopeful the speculators are as they enter 2007's condo market. An additional three units are listed through McWilliams/Ballard. DC6283281: unit #1100: 1/1.5. Its list price hasn't changed since January. The sales documents included a penalty for selling the unit during the first year, maybe longer; i can't remember. This and a limitation on the percentage of units that may be rented may have made it easier for new oweners to obtain financing. However, the reason there was less of a run to sell may have had something to do with the fact that owners began closing and moving in in the spring of 2005, well before the Artisan was completed and before the market went south. if my previous comment regarding the financial penalty in the sales documents did not reach you, let me know.